LOUISVILLE, Ky. – UofL gastroenterologist Matthew Cave, M.D., believes that chemicals we breathe, consume or come in contact with in the environment may be contributing to liver disease in as many as one in four people. He has been awarded $4.01 million over eight years by the National Institute of Environmental Health Sciences, one of the National Institutes of Health, to explore the long-term effects of environmental chemicals on the liver. "In environmental health, the study of liver disease is relatively new, particularly in the field of endocrine disrupting chemicals," said Cave, associate professor of medicine in gastroenterology at the University of Louisville School of Medicine. "These chemicals, such as bisphenol-A (BPA), found in plastic drink bottles, may cause endocrine and metabolic diseases like diabetes and obesity, or make them worse," Cave said. With the NIEHS award, Cave plans to explore how any number of endocrine disrupting chemicals contribute to fatty liver disease. The flexible nature of the award allows him to redirect the research over the course of the funding, and adapt the work in light of new leads. Cave is one of eight environmental health scientists receiving the new Revolutionizing Innovative, Visionary Environmental health Research (RIVER) Outstanding Investigator Award from the NIEHS. Awardees were selected based on their record of innovative and impactful research. Cave's eight-year funding is the maximum awarded for this program. The new RIVER awards differ from the NIH's traditional approach of funding projects designed to study specific aims, which can steadily produce new knowledge but may limit scientists when their results suggest new directions. Through RIVER, Cave will be able to explore novel directions of research in environmental liver disease. "The RIVER program is designed to fund people, not projects. It gives outstanding environmental health scientists stable funding, time, and importantly, flexibility to pursue creative scientific ideas, rather than constantly writing grants to support their research programs," said David Balshaw, Ph.D., chief of the NIEHS Exposure, Response and Technology Branch who leads the NIEHS team overseeing this initiative. "This funding mechanism gives us the flexibility to study this evolving field and the freedom to pursue the hot leads as they develop," Cave said. "I am very flattered to receive this award. It demonstrates the confidence the NIEHS has in my work." While the specific projects will evolve over time, Cave's initial work will focus on exposures to polychlorinated biphenyls (PCBs) and vinyl chloride. PCBs are chemical compounds previously used in electrical equipment and other products. Although banned from production in 1979, PCBs do not readily break down and can remain in the environment. Vinyl chloride is used in the production of polyvinyl chloride (PVC), from which plastic pipes and other construction materials are formed. Both compounds are known to cause liver damage. Cave plans a multi-tiered research approach, beginning with cell cultures and animal models and then in humans. As a framework for his research, Cave will establish the Environmental Liver Disease Revolutionizing Innovative, Visionary Environmental Health Research Program (ELD-RIVER), a unique integrative and collaborative research program including collaborations with academia, government agencies, industry, and scientific/medical societies. 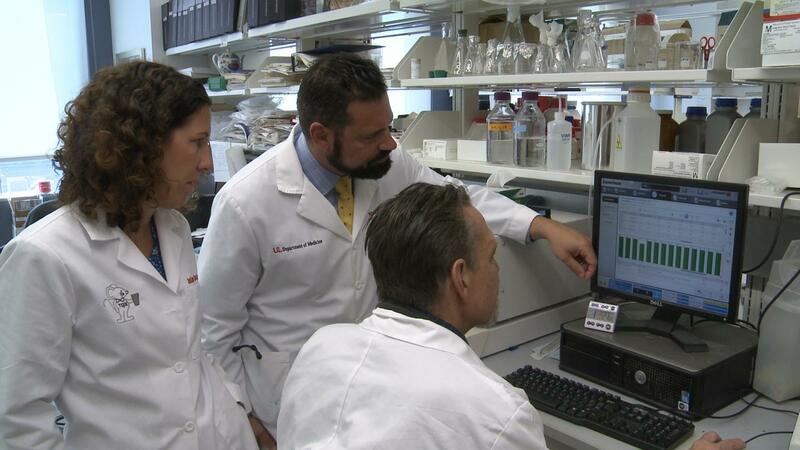 Cave and award co-investigator Juliane Beier Arteel, Ph.D., are collaborating with UofL's NIAAA Alcohol Research Center, Diabetes and Obesity Center, and researchers in cardiology, biochemistry, pharmacology and toxicology, as well as the Environmental Protection Agency.